In the Malaysian drifting community , the 5 rounds of the ACE Drift challenge series was long regarded as the ranking system for the drifters here. The overall champion of the series would be heralded as the National Champion. This year, with the backing of Westlake Tyres as their title sponsor, ACE Drift Challenge have be renamed as the Westlake Drift Series thus making this the new Malaysian ranking system. Being crowned 2010 National champion and losing it the following year due to a string of mechanical failures during that year’s series made me extremely eger to regain the title this year. We had made a few set up changes on SLOW based on our runs during our many SODA Sessions held following this event and were happy with the result. Anyway moving on, so it was just left to Jeevan, Francis , Ivan Tan and Jane to carry on with qualifying the next day. *note to Jeevan: A thousand apologies macha..I’ve looked high and low for your picture in WestLake but couldn’t find any. So I googled ‘Black Ninja’ and this picture came up!! So there..BLACK NINJA!!! Jeevan with his ‘Black Ninja’ decided to not carry on during qualification due to the sounds akin to a bunch of shirikins rattling in his rear LSD housing. So with a puff of smoke from his smoke bomb, he deceptively made his exit from the competition!! Ivan Tan; one of the few drifters that got into the sport in the heydays , failed to get the car started on the next day!! Wiring perhaps ? But being a sport he is , he appeared unfazed and continued enjoying himself from the sidelines! Francis with his B(ig) cockroach A31 qualified 20th out of 40 odd drivers!! However , nerves got the better of him during the tandem runs which saw an early exit. In time I am sure he will overcome this and will be a top contender!…that is if he keeps his car in one piece. Last seen it really looked like a squashed cockroach! This entry was posted in Drifting, Posting by Ariff on March 27, 2012 by skagee. Jane and I had so much fun during last year’s Batu Pahat Drift Challenge that we vowed to come back again this year. This time we brought along the whole SODA Session team; which includes Francis, Kevin Rajoo, Mah Lao ,Jeevan and Heng. Due to their cars not being ready, Jeevan and Heng did not get to compete. In actual fact , Kevin’s competition car was also not ready but he brought along a SR20NA powered BMW E30 and drifted the car for the whole 1st day of practice. This car , which was inherited from his brother Ivan ,due to it’s poor setup was virtually impossible to drift. He then somehow persuaded Francis to loan him the Cockroach A31 to qualify with. No wonder I kept hearing Kevin saying “You are special” to Francis prior to borrowing the Cockroach. Qualifying was a straight forward affair with everyone getting two consecutive runs. I was ecstatic to hear that the whole SODA team qualified, with me in 3rd and Jane in 10th!! Great job guys!!! So then it was time for the tandem battles!! Being only his 2nd competition , Francis did a good job managing to qualify into the best 32 but due to the lack of experience, nerves got the better of him during his 1st tandem run. I am sure with more competition seat time, he will overcome this!! Kevin Rajoo, kept a cool head through out his best 32 and 24 tandem runs but was caught off guard in the best 16 due to being unfamiliar to the Cockroach’s handling. I am very sure he would have gone further if he had used his competition 180sx! Mah Lao drifted well , going through top 32 but was knocked out in the top 24 when going against Jason Tan who drifted consistently the whole weekend! Jane did well going through top 24 but was cut short going into top 16 when she broke her drive shaft while leading. I went up the tandem ladder but hit a snag going against Westlake’s Ah Boy at Top 4. It was weird for me to go against him as he qualified 2nd and me in 3rd and I should be going against the no 1 qualifier ( or whoever beats the no 1 qualifier ) at top 4. It didn’t bother me much though as I drifted a hard as I could. So much so I was certain I had won the run but the judges saw something that I didn’t and a one more time was called and that’s when things went pear shaped; I suddenly developed massive misfire problems and had to hand the win to Boy who drifted flawlessly the whole event! Kevin Rajoo receiving his 15th placing trophy!! Regardless the mishaps and confusions, we all had fun and will certainly be back next year. Our many thanks to the organisers, the sponsors of the event , the esteemed judges and everyone that came up to us throughout the weekend. Many thanks to Mike , Cheryl and Cathy for helping out with Johanna…. This entry was posted in Posting by Ariff, SODA on March 9, 2012 by skagee. 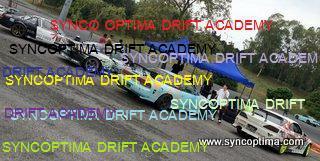 We had the pleasure of having 6 students for our beginners drift lesson in Shah Alam. This entry was posted in Drift Lesson, Posting by Ariff, SODA and tagged karn drifter, namza drifter, namza karn drift thailand, thailand drift on March 2, 2012 by skagee.